Having the right business travel equipment and accessories is critically important for regular business travelers. With constant changes in airport security rules, having travel kits can certainly make airline travel a lot more comfortable. It is good to buy kits that contain various grooming supplies like travel size deodorant, skin lotion, and hair care products. Make it easy to retrieve your toothbrush and other personal care items by packing them in a toiletry kit. It is true that when you unpack your baggage after travel, business suits get quite wrinkled. It will be a good idea to carry a portable garment steamer if possible – so that you can save avoidable expenses. It is a fact that business travelers frequently visit the same cities and towns. Road maps that assist travelers in getting around the city or finding shopping, restaurants and other points of interest can be extremely useful. For business travelers, cell phone can be the most critical thing to carry around as this handy piece of electronic equipment can help you stay in touch with colleagues and business associates. You can also use a smart phone to hold your daily schedule and check your email as well. If you travel frequently for your company, it is prudent to invest in a wireless Internet card for your laptop. This piece of business travel accessory can help you stay connected with your office, even in the most remote places. Chargers are available for all kind of electronics including cell phones, iPods and laptops. Other useful travel accessories one can carry include items like sleep masks, head rest, ear plugs, a travel hair dryer, reading lights, back packs, personalized luggage tags and travel blankets and napkins. The type of travel equipments and travel accessories you need, will depend on the duration of the journey, the mode of travel destination you are heading to, and what you are going to be doing when you get there! Most travel accessories are portable and have features like foldable handles, for easy packing. They differ from regular appliances in that they are much more compact and specifically designed for travel. 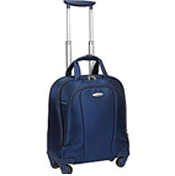 It is wise for a business traveler to buy a travel bag particularly for undertaking frequent short trips. These bags are indeed convenient with sturdy wheels. On the inside, the front compartment is expandable, and there is a tri-fold removable suit hanger to help reduce wrinkling and a removable toiletry kit. Pack this travel bag along with your laptop and you are most comfortable to go wherever you want.